The Blytheville School District employees contributed $3,683.71 for the United Way of Greater Blytheville during their most recent campaign that ended in mid-December. 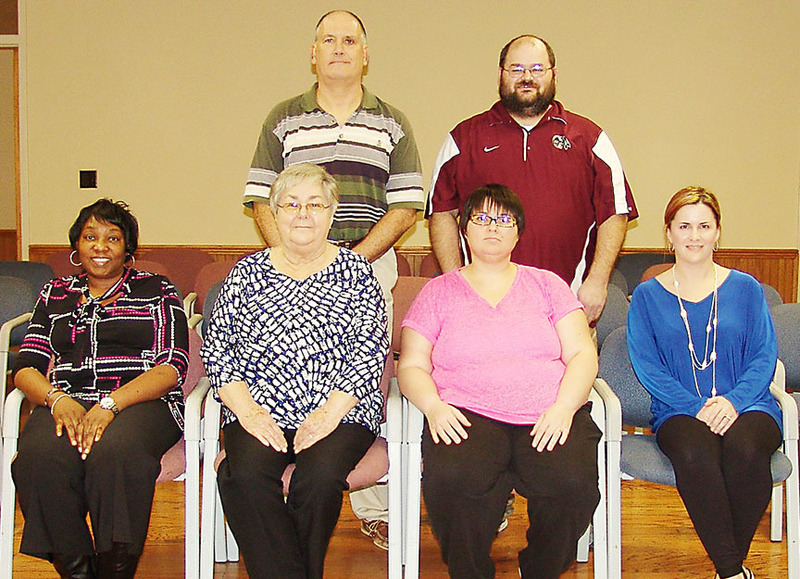 Pictured are United Way executive director Mary Helen Moody (seated, second from left) with chairpersons (from left) Johnetta Orr, Nicole Turney, Tiffany Snyder, (in back, left) David Cooke, Michael Davis, (not pictured) Carolyn Barnes, Shelly Long, Diane Jenkins and Michelle Walling. The Blytheville School District employees are similar to most people in that they continue to feel the impact of an economy that, although may be improving somewhat, is still a long way from getting better – both locally and on a national level. Still, this hasn’t kept the employees from helping their community financially. The Blytheville Schools’ report to the United Way of Greater Blytheville’s 2015-16 campaign shows a total contribution of $3,683.71. Of that amount, $603.31 (16 percent) was given to the local United Way in cash and checks, and $30 (one percent) in pledges will be given. The remainder of the contribution, $3,050.40 (83 percent), will be paid on a monthly basis through payroll deductions. The schools’ campaign was completed in mid-December. The district employees’ gift represents 1.8 percent of the local United Way’s goal of $200,000 to be raised. Mary Helen Moody, executive director of the local United Way, stated that right now the Blytheville School employees are the top contributors in terms of employee gifts. A year ago the school district was the No. 2 employee contributor to the United Way. David Cooke, the district’s public relations director, organized the schools’ United Way efforts and was the chairperson of the drive for the administration building. Eight other chairpersons were responsible for the four schools, the Maintenance/Custodial and Food Services departments. Those chairpersons were Michael Davis of Blytheville High School, Michelle Walling of Blytheville High School ALE, Shelly Long of Blytheville Middle School, Nicole Turney of Blytheville Elementary, Diane Jenkins of Blytheville Primary and Johnetta Orr of BPS’ kindergarten center, Carolyn Barnes of the Maintenance and Custodial staff and Tiffany Snyder of Food Services. Davis and Long are new chairpersons. A total of 228 of 392 employees (58 percent) participated in the local United Way campaign. The average gift per individual contributor is $16.16. ALE and Blytheville Elementary School achieved 100-percent participation among their employees (57 and 23, respectively) in terms of number of employees participating. United Way of Greater Blytheville funds will be allocated to 12 local agencies for 2016, and every penny of the local money remains in Mississippi County. Those agencies are the American Red Cross’ NEA Chapter, Area XIII Special Olympics, Blytheville Community Samaritans, Blytheville/Gosnell Area Food Pantry, Boy Scouts of Greater Blytheville, Court-Appointed Special Advocates, Charles Strong Recreation Center, FOCUS, Girl Scouts of Greater Blytheville, Great River Charitable Clinic, the Haven of Northeast Arkansas and Legal Aid of Arkansas.